Rose wine is generally not simply a blend of white and red wines, as its appearance might suggest. Instead, a winemaker typically makes rose by removing the grape skins from the fermenting wine as soon as the liquid has reached the desired color, rather than allowing the skins to stain the wine dark red. After that, she makes the rose as if it were a white wine. Storing rose properly will prevent the cork from falling out or the wine from losing its flavor or tasting like vinegar. Place an unopened bottle of rose on its side, ideally in a wine rack. This will keep the liquid in contact with the cork and thereby prevent the cork from drying out and allowing air into the bottle. Store the unopened wine at approximately 45 to 60 degrees F. The exact temperature within this range is not as important as the consistency of the temperature, which ideally should fluctuate little if at all. If possible, however, aim for 50 to 55 degrees F; this is the ideal storage temperature for wines. This storage place also should be dark and have a humidity level of approximately 60 to 70 percent. Serve the rose wine at approximately 51 to 54 degrees F. Depending on the temperature at which you stored your rose, you might need to allow it to warm slightly or place it in the refrigerator for a few minutes to achieve this temperature. Return the cork to your opened bottle of rose if you do not consume all of the wine. Store the opened (but corked) bottle in the refrigerator. You may keep it here for several days before the quality declines noticeably. Use your unopened bottles of rose wine within approximately two years if possible. 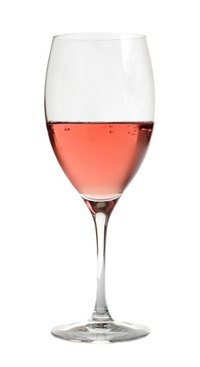 Unlike many red wines, rose wine does not benefit from long aging. Terroir France: Is Rose Wine Made From White or Red Grapes?